For decades Prof. Schmidhuber's talks have featured slides such as the one above. According to Nature's millennium issue, the most influential invention of the 20th century was the one that triggered and sustained the human population explosion: the Haber-Bosch process. Billions of people would not even exist without it. 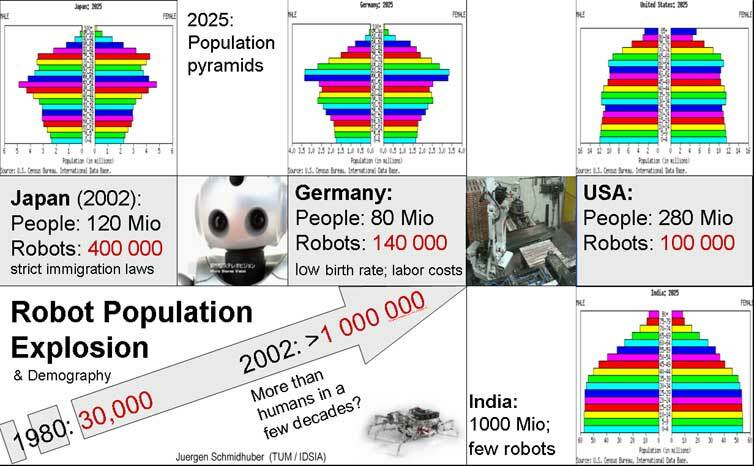 Currently we are living through a robot population explosion. It is most visible in a few countries where the human one has stopped. See Japan's and Germany's weird population pyramids above (projections for 2025): few young people; many old people. Eventually all nations will feature similar demographic statistics. Then who is going to do all the work? Robots, of course. In 1980 there were just 30,000 robots; in 2002, already 1,000,000, almost half in Japan, one third in Europe, especially in Germany, the world's 2nd-largest market. The robot population explosion might eventually overtake the human one, once cognitive robots no longer have to be hardwired but learn by themselves. That's what they are working on at TU Munich's lab for cognitive robotics.